As early as February 4th, you will no longer be able to create new Google+ profiles, pages, communities or events. S If you’re a Google+ Community owner or moderator, you may download and save your data for your Google+ Community. Starting early March 2019, additional data will be available for download, including author, body, and photos for every community post in a public community. If you sign in to sites and apps using the Google+ Sign-in button, these buttons will stop working in the coming weeks but in some cases may be replaced by a Google Sign-in button. You’ll still be able to sign in with your Google Account wherever you see Google Sign-in buttons. If you’ve used Google+ for comments on your own or other sites, this feature will be removed from Blogger by February 4th and other sites by March 7th. All your Google+ comments on all sites will be deleted starting April 2, 2019. A new year is a great time to reassess everything you’ve been doing and find ways to improve your social media marketing strategy. Like most digital marketing channels, social media is always evolving. People’s behaviors are changing, as are the technologies and capabilities of social media platforms. So what will be the key social media trends you need to know in 2019? If I were to sum it up – well, I wouldn’t. “While we’ll see a lot of changes in 2019, to me it really still comes back to understanding your audience, crafting different, targeted and appropriate messages for those audiences, and creating engaging content.” But there’s a lot to unpack in that one statement. Which is exactly what we’ll start doing right now. Read on for 10 important trends that will matter most to marketers, brands, and businesses in 2019, according to 30 of today’s top experts on social media. If you don’t show any love to your audience, why would you expect them to show any love or loyalty to you? In 2019, the top focus for marketers should be on being responsive to the people who follow you. After all, social media is all about relationships and engagement. Being authentic and timely is a good start. “This means responding quickly to customer complaints, issues, and questions, Doing this in a real way that nurtures and supports the customer or audience first is also important for overall social brand loyalty.” Companies need to remember that the “newness” of social media is over. “Smart businesses are starting to understand that connecting and marketing with users through social media sites and applications is about being present and interacting within the site and application, instead of just using them to get visibility and traffic back to your website. In 2019, businesses need to really take the time to understand their customers and how they interact with the brand on each social media site, and then engage with them in the right tone, with the right medium, and in their communities.” In 2019, social media will shift even more toward 1:1 interactions, rather than 1:many broadcasting that many brands and businesses have been doing. “One of the absolute best things that brands can do on social media is to be responsive to their customers and engaged with their audience, Your biggest competitive advantage will be doing the things that don’t scale: replying to every request, jumping into the comments of all your posts, etc.” “No matter how big (or small) a brand is, every customer type (including employees, investors, etc.) will expect more personal interaction, Brands that can approach social engagement with a true desire to build relationships will be the winners in 2019 and beyond!” Let your audience know that they matter to your brand, and they’ll help you grow your brand. “If you want to increase your reach, become an invaluable resource for your audience, and interact with them accordingly, They’ll promote your brand for you, and your reach will grow considerably.” How can you manage all these social conversations and provide real-time customer service? By making sure you have the right monitoring and tracking tools in place, according to Debbie Miller, President of Social Hospitality. “Businesses that monitor and participate in conversations with their customers (and potential customers) will be able to cultivate more authentic relationships with those folks, and, again, stand out among the high number of brands that don’t,” Miller said. Will 2019 be the year of authenticity on social media? Anna Crowe, Assistant Editor of Search Engine Journal, believes so. “That means less of static updates and more behind-the-scenes, raw, and intimate Stories,” Crowe said. “Stories create a more transparent and meaningful relationship between the user and the brand.” That means more work for marketers and brands because it requires better storytelling. “In order to cut through the clutter, we need to tell stories that matter to people, not your brand,” said Mae Chong, Digital Strategist at Brew Interactive. “We need to share moments that matter to people, not your brand. Lastly, we need to share secrets that matter to people, not your brand.” How do you find content that will matter to people? Dennis Yu may have the best answer: “amplify the signal” by crossing search and social. “Take your very best evergreen web content and create one-minute videos on those same topics, posting these videos to Facebook, LinkedIn, and other channels,” Yu said. “You’ll find that one-minute videos get 400 to 500 percent more reach on LinkedIn compared to Facebook.” “Take your best-performing posts from social and convert them to an article – thereby using social power to fuel search rankings and traffic,” he added. “You can repurpose Facebook live videos and podcasts into listicles, tweets, articles, and other derivative content.” This can be a great strategy because content that worked for your audience on one channel or platform is also likely to work on other platforms – and those audiences aren’t the same. Digital marketing is ever-changing as innovation creates new opportunities for marketers every day. Along with it, your strategy must change and grow with technology to keep ahead of your competitors. Trending digital marketing strategies keep marketers on their toes trying to innovate new and different ways to engage their audiences. In this blog, we’ll take stock of the digital marketing landscape in 2018, discuss what’s changed and what’s new, and see where you should be investing your energy for 2019. Smart companies are leveraging mobile cameras to improve their customer experience. Through VR and AR, you can improve brand engagement and help with pre-purchase decisions by bringing your products to life. By allowing customers to engage in more profound ways through immersive experiences, they are better equipped to find what they are looking for and be delighted in doing so. Consider Amazon, who set up Oculus Rift VR booths around Prime Day, allowing shoppers to experience a wide range of products from nerf guns to refrigerators as they would in physical reality. By empowering potential buyers to literally picture themselves owning products and simulate this potential reality, VR preemptively addresses needs and pain points, greatly enhancing the customer journey. When getting users to a specific physical location isn’t possible, augmented reality can provide greater flexibility and reach through integration with mobile apps. StubHub executed this masterfully, introducing an AR feature that allowed fans to better understand the city and stadium ahead of this year’s Super Bowl. Potential ticket buyers could click to see a 3D map of the stadium, parking, transit lines, and more, making it easier to envision themselves at the event. By deploying virtual or augmented reality strategically, you have a unique opportunity to supply consumers with the depth of pre-purchase information they crave, while minimizing the effort they must take to obtain it. In the past, digital marketers have been hesitant to incorporate artificial intelligence into their strategies. But as AI continues to prove itself useful for simplifying data-based experiences and improving user experience, confidence in it has increased. 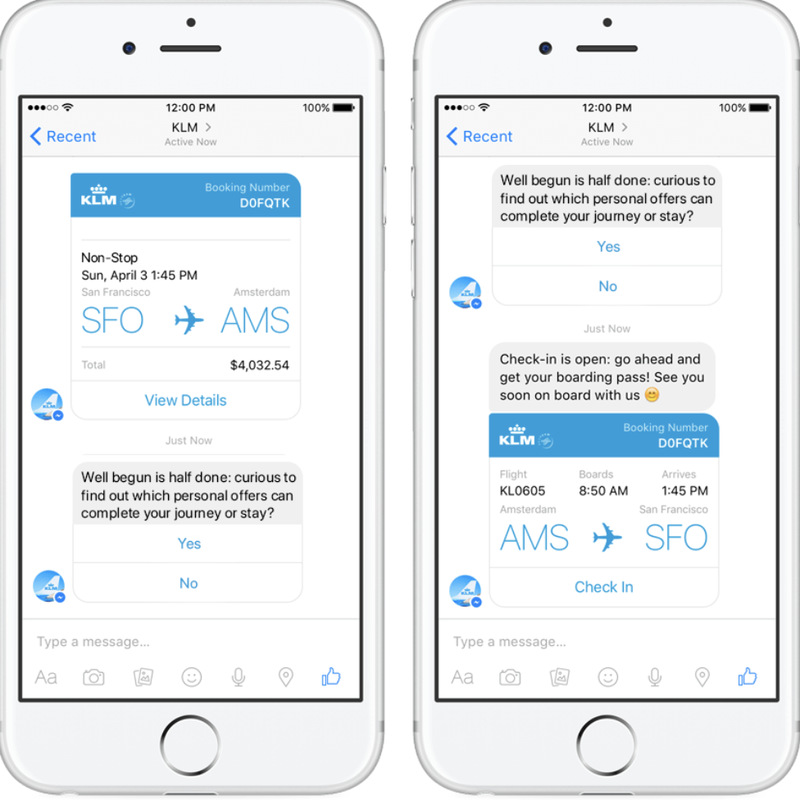 KLM has done a great job with this, creating a plug-in with Messenger that streamlines everything from booking to check-in and flight status updates. It’s a win-win for both sides: travelers can access all their travel info from anywhere, and KLM can supply it to them without tying up personnel. Chatbots can also be valuable for facilitating pre-purchase decisions. For instance, Bing’s Business Bot, which is embedded into search results, allows interested users to have basic questions answered by the businesses around them. If their query is not on the pre-configured list, the bot refers them to a phone number. The bot also asks business owners additional questions based on what users are looking for, so that common requests can be answered faster in the future. By refining responses to fit user needs, artificial intelligence allows you to help users better and faster over time. Search is evolving beyond its text-only origins, meaning that visual and voice search deserve serious consideration now. Think of visual search as a sort of reverse search, using images to find text-based info instead of the other way around. Google, Microsoft, and Pinterest have all jumped into the fray, and it’s only going to get bigger over time. Marketers can gain an edge here by preparing tailor-made content to await potential customers after their image searches, while also gaining even more insights into their preferences. Voice search also continues to grow as a way for consumers to find more information without even having to lift a finger. 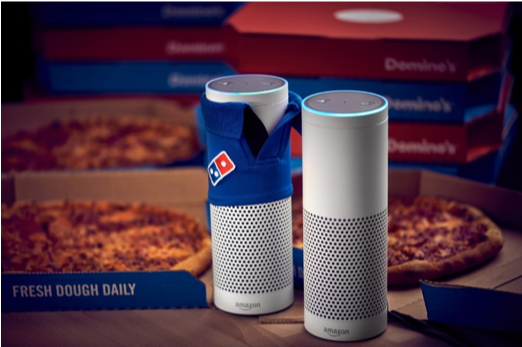 Domino’s has done well here, teaming up with Amazon Echo to let customers order pizza hands-free. Allowing people to interact with you via voice search makes their life easier, and offers a chance to incorporate brand personality and tone in the way you respond. The dynamics of voice search also present a challenge for digital marketers, who must figure out how to optimize for both humans and devices. With the shift from desktop to mobile a consistent digital marketing consideration, it should come as no surprise that mobile video ads continue to be hot. Savvy marketers are using videos to both engage their audiences in-app between tasks and on social platforms. What’s new, however, is the movement towards more vertical video. Instagram’s recent introduction of IGTV continues this trend, allowing users to create long-form vertical videos. While advertising is not available (yet) on IGTV, its great place for brands to share their longer content organically. The success of IGTV and other similar platforms is worth keeping an eye on, as it could cause a major shift in favor of vertical video. If this is the case, marketers will need to create horizontal and vertical assets to reach their audience fully. These emerging digital marketing strategies make it easier to both reach customers when and where they are ready to buy and improve their experience post-purchase. Competitive companies know that capitalizing on new forms of content and technology will help them capture new audiences on fresh playing fields. So which of these hot new digital marketing strategies do you plan on implementing? It is the season to take a look at what worked and didn’t work in your marketing last year. In going through that exercise, I encourage you to test some new tactics for the year ahead. Below are six trends to keep an eye on and how to apply them. 1. 'Mobilfication' We've heard about mobile for the last few years, but for some crazy reason, many businesses are still not taking action. Stand in line anywhere nowadays and watch what people are doing. I can assure you they have their face buried in their mobile device. Mobile will continue to be a top priority for marketers for years to come. Put a mobile strategy in place to engage with your prospects and customers. This means creating a mobile website but, depending on your business, mobile elements might include the ability to send text messages to your customers. For example, the restaurant industry can get away with sending texts once a week with specials, whereas a doctors office would be hard-pressed to send something so regularly. I'd suggest starting off by sending two messages a month, one fun text and one promotional with a call to action. Once you get started, you'll be able to quickly gauge how many messages your audience will respond to. 2. Media Properties What type of business are you in? Regardless of your answer, I would challenge you to start thinking about your business as a media company. Where do you get most of your information about what's going on in the world? Whether you read your news online or still read a paper copy, the news controls the conversation for the day, week or month. The best way to control the conversation in front of your prospects and customers is to get in front of them with quality content. Launch one media platform that's 100% focused on providing helpful, authentic content to your end customers. This could mean a podcast, a well-written and thought-out blog or even a livestream video that you film on a weekly basis. The business that produces the best (and most) content will come out on top. 3. Chatbots Chatbots are all the rage as of late and for great reason. If you're not familiar, think of them as a tool on the other side of a computer that can respond to your customers' questions or comments. Chatbots are used for engagement, customer service issues, general questions and even closing business. I've been testing them out the last six months and the results have been off-the-charts. The crazy thing is, if you set up the bot correctly, it's very tough to tell if you're talking to an actual person or a bot. Launch a website or Facebook chatbot to engage with your prospects. Find something fun or engaging to start the conversation, as the prospect needs to initiate the chat. I'm a huge fan of data-driven marketing and have seen open rates exceed 80% or higher with an engaged audience. So, if you send 1,000 messages via your chatbot tool, chances are high that at least 800 people will see your message. Those rates are far superior to email open rates, making this a unique channel not to ignore. 4. Reviews Organic traffic from SEO continues to be one of the best sources of web traffic for many businesses. While there are a lot of elements involved in ranking, the number of reviews you have is a key factor. Google looks at your Google reviews, Facebook reviews, Yelp reviews and more. Why would Google want to prioritize a business in the search rank that has a one-star rating? While your reviews are essential for search engine rankings, they can also make or break a sale for you. According to research, half of adults under the age of 50 regularly check online reviews before purchasing a new item. What will they find? I hope a substantial amount of positive reviews that makes the decision easy. Put together a solid plan for getting reviews for your business. Be careful not to incentivise people (as this is not allowed), but instead have a system for asking for reviews. 5. Video I expect to see more Facebook Live videos and a rise in web TV. In many surveys out there, consumers say they much prefer video over text. Video helps tell more compelling stories, gets your point across faster and can improve sales. Video on a landing page or sales page, for example, can help increase conversions by as much as 80%, according to research. Get started by committing to doing four videos per month. Whether you do a Facebook Live, YouTube video or a video for your website, it doesn’t matter. Get into the habit of producing quality video content for your prospects and customers. 6. Branding Versus Direct Response Telling your story versus telling people what to do is critical. To paint a more vivid picture, let me provide an example. Educators Credit Union, hosts dozens of events throughout the year that provides value to their members and portrays their brand to the community. Several times a year, they host a shred day, allowing members to bring their papers to be shredded at no cost. Their team is there to help and makes it a fun, community-based day. There are no fancy calls to action. Instead, they're continuing to keep their name out in the community and telling their story. Stop focusing all of your attention on the call to action and make sure you're delivering value first, telling your story and portraying your business in the best possible light. Above, I've provided six trends. Pick one and execute. Ready, set, go! In the past year, Google and Facebook have deployed technology that makes media articles load faster on mobile devices — the former uses Accelerated Mobile Pages (AMP) to do this, and the latter relies on Instant Articles. AMP pages and Instant Articles rely on a similar symbol — a lightning bolt in a circle — to stand out from other pages that you can select and explore. Both show text, images, and videos quickly — it’s not as if one of them is much speedier than the other. But when you go beyond what these technologies have in common and start using them more, you’ll begin to see how they’re different. And, at least for now, I personally like one more than the other. Here’s why. Billions of fitness trackers, medical implants, surveillance cameras, home appliances, thermostats, baby monitors and computers in automobiles now are connected as part of a rapidly expanding "internet of things." But many such devices were developed without security considerations. As a result, they are prime targets for hackers. Tips to protect your devices: HOW DO I KNOW IF I HAVE AN "INTERNET OF THINGS" DEVICE? Some of Google's unwitting users are learning a harsh lesson: If you violate the company's policies, it can abruptly cut you off from your Gmail account, online photos and other vital digital services. Several people who recently bought Google's new Pixel phone on behalf of a New Hampshire dealer are now suffering that punishment after the company detected their online purchases and judged they violated its terms of service. Those rules, outlined in a document that few people read closely , forbid the purchase of the Pixel for "commercial" resale. Facebook on Wednesday said that it has bought facial recognition startup FacioMetrics, potentially using the technology for photo or video effects to better challenge rival Snapchat. "How people share and communicate is changing and things like masks and other effects allow people to express themselves in fun and creative ways," a Facebook spokesperson said in an email reply to an AFP inquiry. Facebook on Thursday worked to ramp up enthusiasm for its virtual reality line, unveiling new gear including a lower-end wireless headset prototype. The company's Oculus virtual reality division is set to release in coming months a new "Touch" controller and a more affordable computer for powering virtual experiences using Rift headsets. Facebook says some 450 million people use its site - mainly the “Groups” feature - to buy and sell stuff locally, anything from cars to baby clothes to furniture. Now, the company is launching a separate “marketplace” section that seeks to make it easier to do this. The last time Facebook tried its hand at such a marketplace was nine years ago, and it didn't really go anywhere. Like Facebook itself at the time, it was a desktop computer-only product. The latest effort, or course, works on mobile devices, so it's easier to snap a photo of the item you are selling and upload it on the site. Facebook Inc. said Monday the most popular items people currently buy and sell on the service include furniture, cars and clothes. Apple Inc launched its Apple Pay software in Russia on Tuesday as the U.S. technology firm extends the global reach of its payment service. Russia is the 10th country where Apple Pay has been made available, following the United States, Britain, Canada and others. The service was first launched in 2014 and will initially operate in Russia with partners Sberbank and Mastercard. To use Apple Pay, consumers tap their iPhone over payment terminals to buy coffee, train tickets and other services. It can be also used at vending machines that accept contactless payments. Alphabet Inc's Google is expected to unveil new smartphones at an event on Tuesday, the company's latest effort to sell consumers on a Google-branded device and to challenge Apple Inc at the high end of the market. Analysts predict the San Francisco product launch will also showcase other Google hardware initiatives, including a voice-controlled speaker system called Home to challenge Amazon.com Inc's Echo device, and a virtual reality headset. Internet users in Dubai will soon switch to next gen technology for data transfer aka Li-Fi, dubbed as the next generation of high-speed internet. Dubai will be the first city in the world to get the Li-Fi service. What is even more interesting is that Li-Fi service will be transmitted through the city’s streetlights. Each of these high-end design lamps would cost around $1000. The first phase, planned for Dubai smart city will be rolled out by the end of this year. Almost 80 years old, the deodorant Old Spice is learning new tricks for finding customers in the era of smartphones and social media. The Procter & Gamble product, having spoofed itself for years with advice on how to become more "mantastic," posts to its 2.6 million Facebook followers a steady stream of video games, prize entries, and advertisements as short as two seconds. Do you know that 76 % of people with mobile internet are using apps ! App is a smartphone or tablet application. Unlike a mobile website, the app gives businesses the advantage of having their own corner on a customer's device.